Although a little later than the above timeline suggests, due undoubtedly to just how much effort was required to bring EMMs up to the level required for validation, Google have worked incredibly hard to bring AER to other areas of the Android Ecosystem since 2018, and I’m very pleased it’s now come to fruition! As we transition away from device admin management and toward Android Enterprise this year, looking across the EMM landscape there are still examples of EMMs who don’t fully support the solution sets, don’t actively advocate Android Enterprise first with their customer base or simply don’t know very much about modern Android management in general. We’ve definitely come a long way compared to how it was some years ago, with EMMs picking and choosing which OEM APIs to support based on customer demand or, often also likely, taking a gamble on what might be useful to customers, but there has definitely been a fair amount of fragmentation – even between top-tier vendors – in the industry which Google has aimed to address with AER. Just as AER for OEMs set out to create a benchmark against which devices should meet or exceed in order to guarantee a consistent, reliable experience for management, AER for EMMs aims to do something similar. The requirements are described in-depth in the glossary here, and an overview is available here. 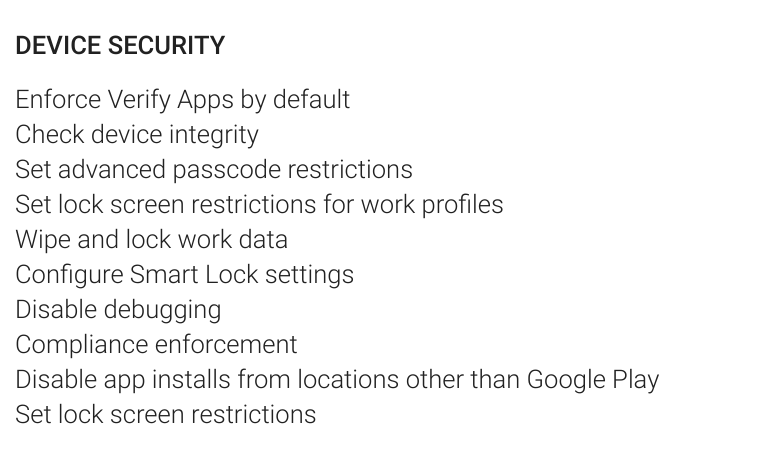 In a nutshell, Google are going to validate EMMs who demonstrably put Android Enterprise front-and-centre over legacy management, have a healthy install base and can lean on excellent product knowledge, useful collateral and confidently sell the solution to the market. The obvious difference when compared to AER for devices is that it isn’t purely about feature support as such, even though that certainly forms part of the wider validation, but the whole experience of working with an EMM. I’d seen first-hand some of the background work going into AER prep in the second half of last year, where EMMs were – as if by random – adding features available as far back as Lollipop, knowing AER was on the horizon, it wasn’t too difficult to connect the dots! How are AER EMMs identified? EMMs validated can be found here. 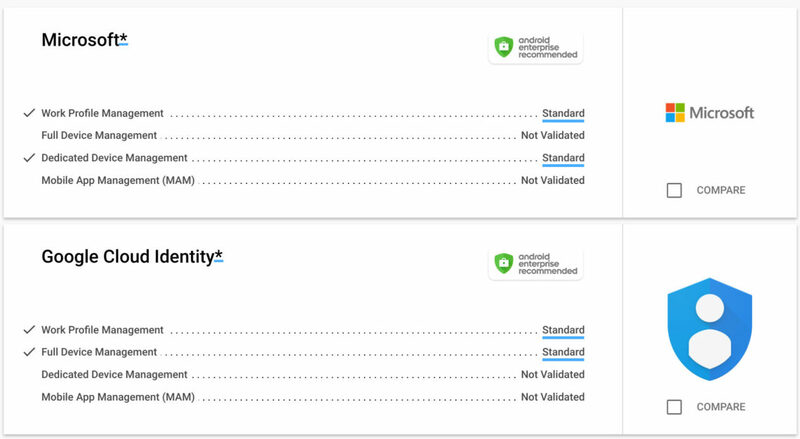 Each validated AER EMM can be identified by the AER badge, those yet to pass validation are equally listed, but go without the little green shield. Google are launching with a number of initial partners, namely Blackberry, Google Cloud, I3 Systems, IBM, Microsoft, MobileIron, Softbank, SOTI, and VMware (in alphabetical order). There are a few expected names in that list, MobileIron and VMware for sure given there’s little doubt they’re leading the way for Android Enterprise in the market today – not only due to COPE support, but things like VMware’s video series, MobileIron’s blogs and whitepapers and the general AE-first approach the vendors are taking. No one would disagree with the likes of IBM and SOTI (who’s dedication to Android management over the years has been incredible) either! Should Microsoft qualify as an #AndroidEnterpriseRecommended #EMM today? They’re not quite up to scratch just yet. The asterisk is intended to suggest they’ve committed (ie. roadmap) to meeting Google’s requirements and recommendations in the near future, and will continue to develop their product through 2019. Speaking for Microsoft (as I can’t for Google Cloud), they are the first big vendor to adopt the Android Management API (AMAPI) as I’ve pointed out before, they’re also incredibly active in the ecosystem and despite a late start, are working around the clock with Google to bring missing features to fruition. In fact, COBO support just launched in preview. It would appear as such Google are giving both of these vendors the benefit of the doubt and have brought them into the programme with the very clear caveat there’s work still to be done. Until fully validated and the asterisk removed, These vendors should not actively use the badge, so any concern of this causing confusion from an EMM marketing standpoint is suitably subdued. That said, the wider industry will take from seeing these vendors in the list what they want, and I’ve more than enough examples already from customers to partners, carriers and other vendors to suggest this could have potentially been far more clearly explained. Hopefully this article will go some way to helping with that! The programme is definitely an eye-opener into the capabilities of EMMs broadly; particularly for me having neither the access nor the capacity to be constantly jumping in and out of various platforms for testing, being able to pop on over to the partners site and pull up what vendors do and don’t support without needing to find a tenant is very useful. Hopefully it’s frequently updated to maintain this information. 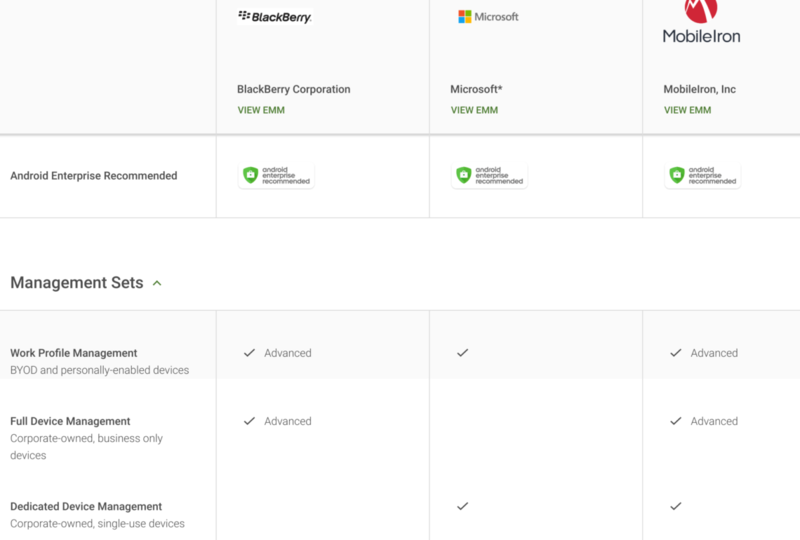 As Google continue to expand the programme, it really can’t be overstated how important Android Enterprise Recommended is for the ecosystem. From the profound difference AER for devices has made over the last year for device selection – whether how OEMs support and market their devices, customers select them or MSPs recommend them – AER has improved this process across the board by adding clarity, setting expectations and instilling confidence in what was once a process laced with uncertainty. I believe AER for EMMs will do the very same, offering more consistency across the management ecosystem, providing more control to Google in ensuring the management experience continues to improve (they set the bar for AER, after all), and ultimately resulting in the best management experience for organisations and providers alike. With that said, I’m looking forward to seeing far more EMM players in the market begin to show up, and perhaps even AER subcategories might be considered in the future – some EMMs will focus entirely on dedicated devices for example, such as Wizy or Shoonya, others MAM or BYOD, like Appaloosa; these vendors may never opt to apply for AER because they don’t fulfil the broader requirements, irrespective of how well they support the devices of their chosen solution set or meet other requirements for validation. So, with AER both for devices and EMMs now publicly available, it’s only a matter of time before MSP validation turns up. I’m very much looking forward to that one! How do you feel about AER for EMMs? Is it what you were expecting? If you’re a customer, does AER have any impact on EMM choice? For vendors, how do you feel about the validation? Let me know in the comments, @jasonbayton on Twitter or /in/jasonbayton on LinkedIn!